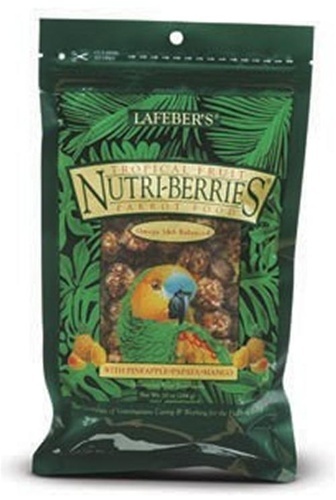 Home > Food & Treats > Parrot Food Blends > Lafeber > Tropical Fruit Nutri-Berries, Parrot 10 oz. Parrots like Amazons, African greys, and Pionus are always on the one-eyed lookout for something extra special at mealtime. 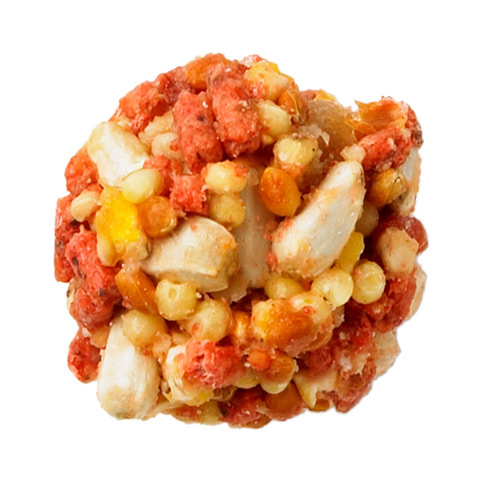 These birds crave foods full of taste and texture, which is exactly what they’ll find in Tropical Fruit Nutri-Berries with its whole seeds and grains mixed with real pieces of pineapple, papaya, mango, and 26% pellets all rolled into a berry shape a parrot can hold and delight in each bite. 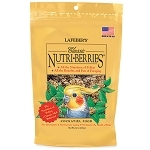 Instead of all the seeds and grains being ground down into a pelleted form, the ingredients in Tropical Fruit Nutri-Berries are left mostly whole to give your pet bird the flavors and textures pelleted diets lack. 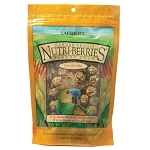 And, unlike vitamin- and mineral-fortified seed mixes that essentially lose their health benefits once the bird cracks open the seed, Nutri-Berries are made with hulled seeds and grains; each berrie is then coated with essential vitamins and minerals to ensure that your parrot receives balanced nutrition in each bite. We also use chelated minerals for better absorption, stabilized vitamins for better longevity, and we naturally preserve and flavor our foods. Newly adopted 9 no old Quaker that was not eating the pellets that they said she was eating. No matter how I disguised them. I got both the fruit & the veggies varieties. She loves them. They are a great addition to her fresh fruit & veggies. They arrived in just days & the price is great. Also very fresh and with a good date. The entire order was very nicely packaged for shipment. I will be ordering my items from BirdSafe consistently in the future. Tropical Fruit Nutri-Berries 10 oz. 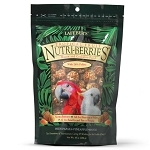 Have been feeding Nutri-Berries to the Amazon & Conure for years.